Combine all in a food processor and mix until combined, transfer to empty zip bottle. Put all spices in small empty mason jar and shake to combine. Cut chicken thighs in chunks. Add 3 tablespoons Garam Masala spice mix to the flour in bowl. Add yogurt to another bowl. Dip chicken thigh chunks in flour, then into the yogurt and then back into the flour. Preheat a saute pan, zip with oil. Add tortilla, flip once it’s had enough time to get toasty. Crack egg atop toasted tortilla and gently scramble. Flip again and cook just until egg is done. Get a tortilla, add tomato, onion, crispy chicken. 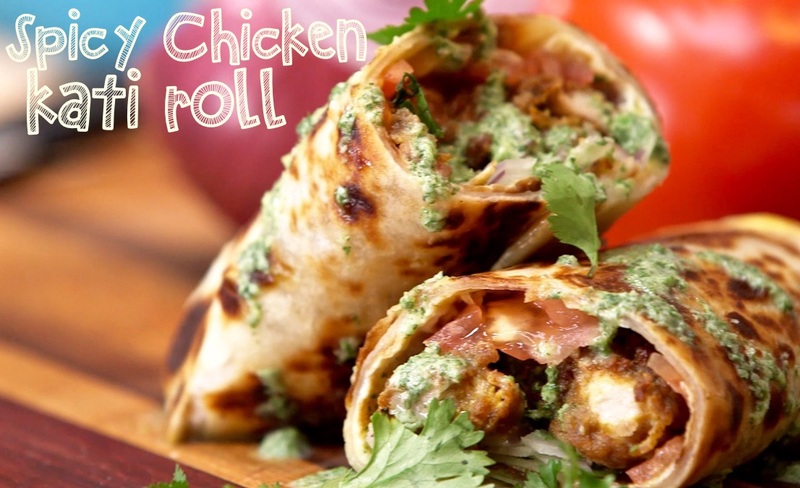 Drizzle with green coconut sauce and roll it up. Garnish with cilantro and enjoy! Combine all in a small mason jar and set aside. Combine all in a bowl and mix until smooth. Add more powdered sugar or milk if needed—you’re looking for a nice, creamy, pourable frosting to dip your donuts in. Preheat your deep fryer or heat oil in a deep sauté pan.You’ll need two biscuits. Press out each one until thin. Make a ring of jelly on one of the biscuits. Top with the other biscuit and firmly press the seams to seal. Make a small hole in the center and seal again. You’re making a jelly-filled ring donut, you get the point! Fry donut until golden, flipping halfway through. Drain on a wire rack. While the donut is still warm, dip it in the frosting and return to wire rack so the excess frosting will drip off. Sprinkle the warm frosting-dipped donut with the everything-bagel-spice mixture. Butterfly sausage and pan-fry until cooked through and seared. Scramble eggs, scallions and cheddar with the dash of salt and pepper. Combine both in a small bowl. Top the donut with the butterflied sausage and scrambled eggs. 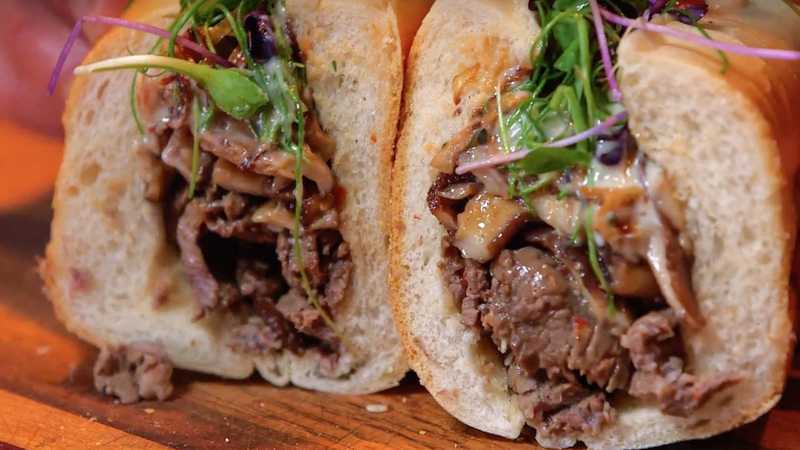 Zip this beast with maple ketchup. Time to amaze your taste buds! 1.Mash banana in microwave-safe bowl. 2.Add cake mix, then add water gradually, mixing until you have a cake-batter texture. 3.Add chocolate chips and microwave until done, about 3 to 4 minutes. Invert onto a plate (careful, cake will be HOT!). 4.Make the frosting: Put a nice fat heaping chunk of peanut butter in a microwave-safe cup for about 30 seconds, until just melted. Gradually stir in milk until you have a nice pourable frosting. Pour over warm cake and sprinkle with coconut flakes. 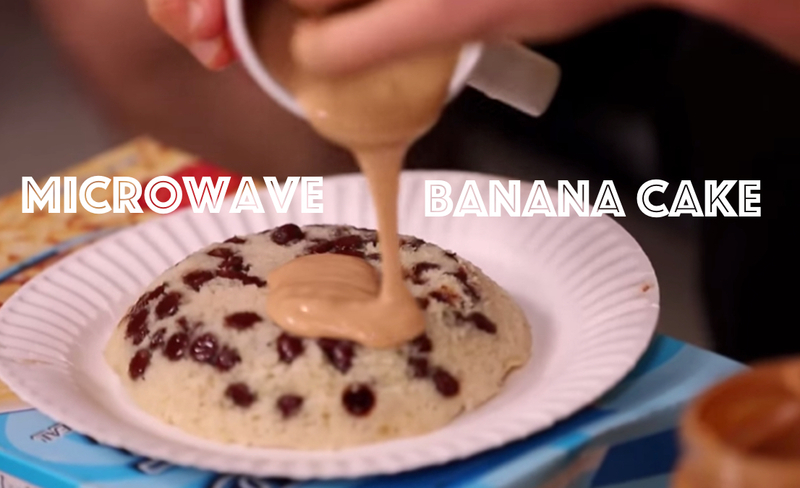 You just made a microwave cake! 1.In a food processor, add garlic, chili, ginger, scallions, cilantro, and onions and blend. Add all meats and blend until you have a nice ground meat mixture. 2.Get your skillet hot and zip with oil. Form 3 thin burger patties on parchment paper. Flip onto skillet and cook until nice and browned on both sides. If you want to get crazy, put a patty on a wonton wrapper, fold over the extra ‘paper’ and fry up! 1.Preheat oven to 450. Get a large skillet hot, zip with oil. 2.Coat entire pork tenderloin with salt and ½ Tbsp. 5-spice powder. Sear in hot pan until nice and brown. Put tenderloin in oven for 20 minutes. 3.Mix soy sauce, rice vinegar, ketchup, remaining ½ Tbsp. 5-spice powder, brown sugar, sriracha, molasses, and sesame oil in a saucepan. Bring to a boil, then let cool. 4.Chop up pork tenderloin and toss in the sauce. Set aside. 1.Chop up bok choy, shiitakes, and garlic. Add to hot sauté pan; finish off with a little soy sauce, rice vinegar and sesame oil. 1.Fry up duck skin and wonton wrappers until nice and crispy. Drain on paper towels; sprinkle a bit of salt. 1.Heat buns in microwave for 20-30 seconds. 2.Make a small cut in the side of each brioche roll and gently stuff with the pork tenderloin. 3.Top stuffed bun with cooked burger patties, sautéed vegetables, crunch, and fresh cilantro. Zip with hoisin sauce and top with other stuffed bun. 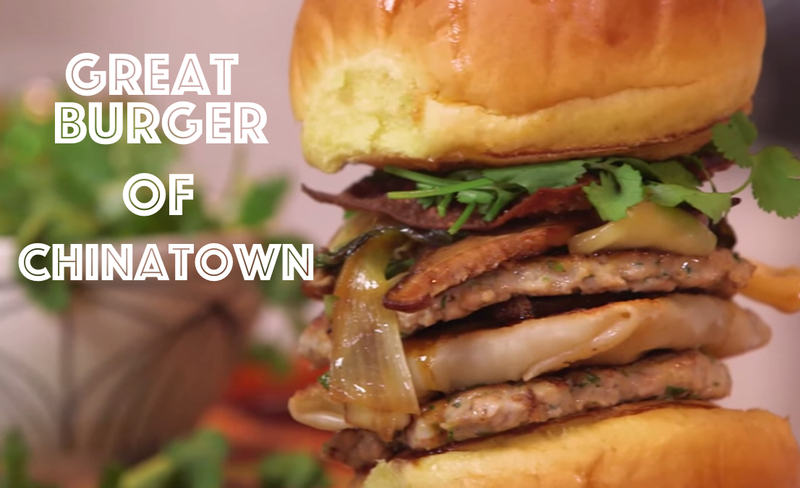 Now’s the hard part—fitting this mouth-bangin’ creation into your mouth! Layer haggis, veggies and cheese on one side of the tortilla. Fold the tortilla over and press down on the top. Wrap tortilla in parchment-paper-lined tinfoil and wrap foil around tortilla to make a packet. Press down on foil packet with a hot iron. (Sounds weird, but it works!) Zip with sauce. Fill a large, high-sided skillet halfway with water and heat on high until simmering. Add the baking soda. Gently roll the pizza dough into 2 sandwich-size loaf shapes. Add to the simmering water and cook about 20 seconds per side. Remove boiled buns with a slotted spoon and drain on a paper towel. Transfer boiled buns to a parchment-lined baking tray. Carefully make small diagonal cuts on the top of the buns with a sharp knife. Sprinkle the tops with pretzel salt and bake for about 25 minutes or until nice and golden brown. Add vinegar, water sugar, salt, and fish sauce to a microwave-safe bowl or a mason jar. Microwave until mixture is hot and sugar is dissolved, about 1 minute. Peel apple, carrots, and daikon with julienne peeler or cut into thin strips. Add to warm pickling solution and let sit until cool. Pound chicken thighs until thin. Whisk two eggs in one bowl. Add panko and flour to another. Dip chicken in panko/flour, then egg, then back in panko/flour. Heat oil in medium sauté pan. Fry chicken until golden brown. Drain on paper towels. Carefully slice open one cooled pretzel loaf with a serrated knife. Spread sauce on one side of bun. Add crispy chicken, pickled veggies, and cucumber. 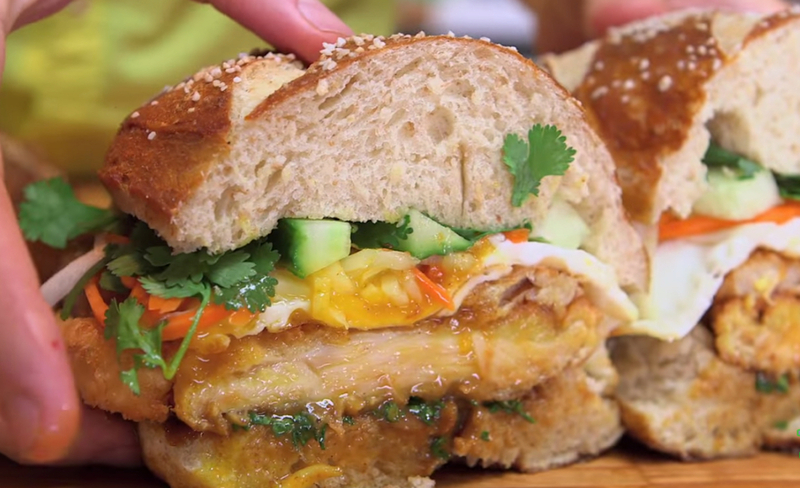 Top with 2 fried eggs, garnish with cilantro, and enjoy the greatest sandwich of all time! 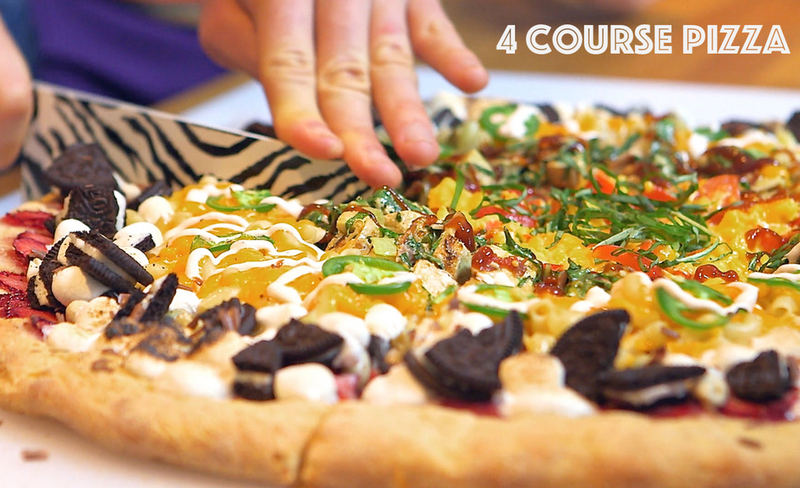 4 Course Pizza – Breakfast, Lunch, Dinner, Dessert in one! Add tomato sauce, horseradish, celery leave, worcestershire, lemon zest, s & p to a food processor and mix until smooth. Set sauce aside. Scramble the eggs with the red pepper and cheese when the pizza is in the oven. In a medium bowl, combine the mayo, mustard, parm, olive oil, rice vinegar, worcestershire, lemon juice, s & p, pancetta and grease and mix until smooth. Chop up the grilled chicken and 1⁄2 head romaine lettuce and add to the dressing. Toss to coat. Set Aside. Boil and drain the elbow noodles and set aside. Combine sour cream and hot sauce in an empty zip bottle to make a delicious spicy mayo. Slice strawberries and toss in sugar. Press out pizza dough on corn meal dusted counter. Use a rolling pin if you need some extra muscle. Press it out until it’s thin and roughly 14” in diameter. Cover the wire rack with foil, zip with oil. Transfer pressed out dough onto foil lined rack. Zip the dough with oil and gently rub it all over. The idea here is to make a bullseye. It doesn’t have to be perfect, just leave enough room for each course. You have 4 of them! Add a bit of bloody mary tomato sauce to the center of the dough. Outside of that, for lunch, add the reserved 1⁄4 cup parmesan cheese. Outside of that, for dinner, add the cooked bacon strips and the shredded mozzarella cheese Outside of that, for dessert, add the sliced strawberries. Par bake the pizza until the crust is just baked. About 10 minutes. Add the scrambled eggs/red pepper/cheese to breakfast. Add the cooked macaroni noodles for dinner. Top with shredded cheddar cheese Add the mini marshmallows and crushed chocolate cookies for dessert. Put back in oven and bake until cheese is melted and marshmallows are toasty. About 7 minutes. Torch marshmallows and garnish with shaved chocolate bar or chocolate chips. Cut up and invite all your friends over! Preheat oven to 350º. You have to par-cook the bacon for a bit so the sugars won’t burn. Place bacon slices on a cooling rack over a parchment-lined baking sheet. The parchment paper really helps with cleanup! Bake the bacon for 10 minutes, flip the slices over, and bake for another 5. In a small bowl combine the brown sugar, vinegar, maple, cayenne and salt and pepper. Mix it up with a pastry brush or clean paintbrush. Brush the par-cooked bacon with this mixture and bake another 5 minutes. Keep brushing the bacon every 5 minutes for a total of 40 minutes. Set a timer on your phone to help you out. This isn’t as annoying as it sounds and it’s totally worth it! Once your bacon is browned and crispy, you’re good to go. Steam the cleaned potatoes: Fill the bottom of a large pot with water. Once water is simmering, add potatoes to a steamer basket and cover with tight fitting lid or aluminum foil. Steam until the potatoes are super-soft and fork-tender–this can take anywhere from 45 to 90 minutes, it just depends on the size of the potatoes. Once the potatoes cool down a bit, peel them. You can do this easily by rubbing a clean kitchen towel on the skin. Transfer steamed potatoes to a large bowl and start to mash them up with a potato masher, wooden spoon, fork, or whatever you have around the kitchen. Once they’re mashed, add melted butter, warm milk or cream, and salt. Mix it all up and get it as smooth as possible. Set aside. Preheat oven to 375º. Spray two 9-inch cake pans with pan spray or lightly coat the insides with vegetable oil. In a medium bowl, combine cornbread mix, masa harina, eggs, buttermilk, melted butter, creamed corn, green chilies, and chopped bacon and mix just until combined. Add more buttermilk or masa if needed. Transfer batter to the cake pans. Add three hot dogs to each pan in a triangle shape in the middle. Bake 25 minutes or until done. Top both cakes with the cheddar cheese and put back in the oven for 1 minute to melt the cheese. Add all ingredients to a small saucepot and heat until it simmers. Remove from heat and let cool. Take one cooled cornbread cake and put on a big plate. Top with chili and mashed potatoes. Place other cooled cornbread cake on top. Cover the whole cake in mashed potatoes. 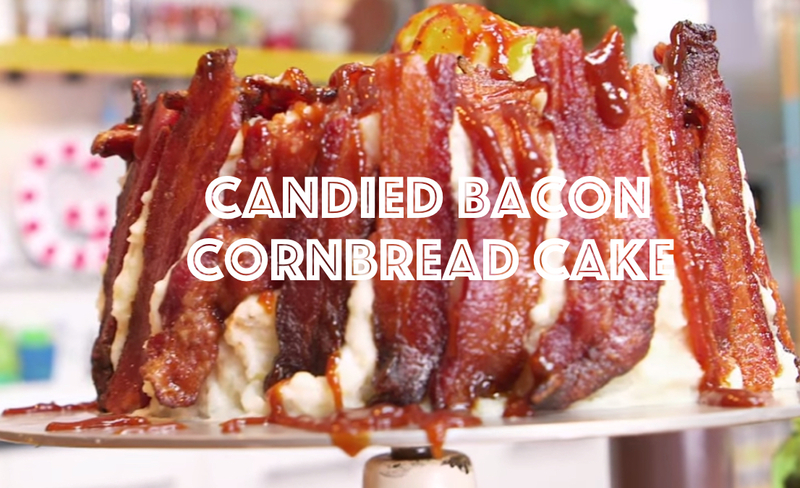 Cover the mashed potatoes with the cooled, crispy, delicious candied bacon. If you want to get fancy, you can top the whole cake with a scoop of mashed potatoes and shredded cheddar cheese. Zip entire cake with the BBQ sauce and dive in! And if you even want to take it a step further: Cut a slice of cake, heat a small pan, zip with oil, and fry/grill the cake slice. Zip again with BBQ sauce and party! french toast – Make a slit in the crust of the challah bread and gently stuff the challah with the marshmallow fluff. This stuff is sticky, you can wet your fingers to help you shove it in there. Once the bread is filled with fluff, combine the eggs, milk, spices and salt in a bowl and whisk to combine. Dip the stuffed Challah in the egg mixture, make sure it gets nice a saturated and every part of the bread is covered. Add the cereal to a plate and completely cover the dipped bread in the cereal. Cook the bread on a hot skillet until each side is nice and golden. 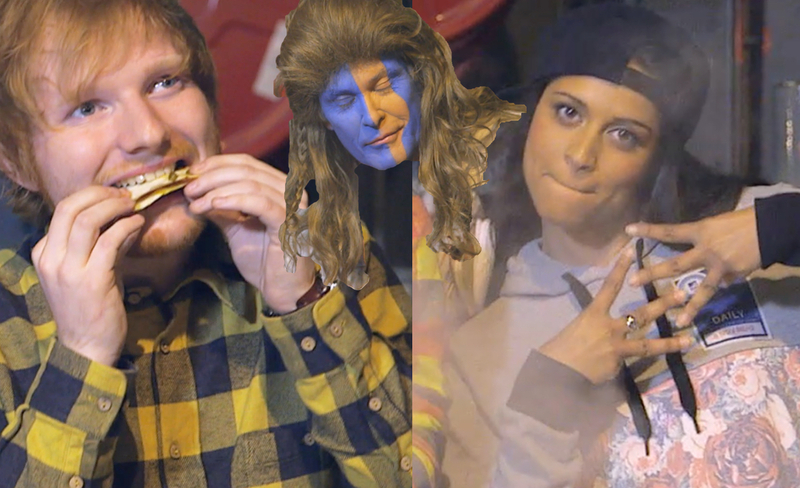 Zip with syrup and prepare to have your mind blown. Montecristo- combine eggs, milk, cinnamon, nutmeg and salt in a small bowl and whisk to combine. Dip glazed donuts in the egg mixture. 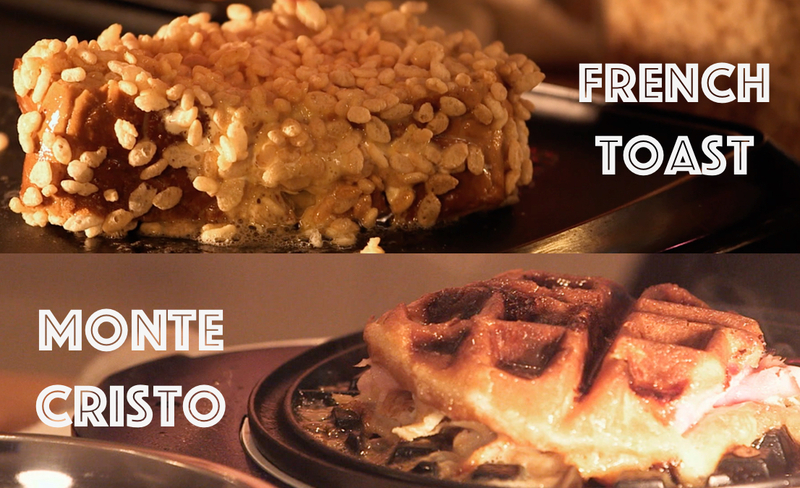 Put dipped donut on a hot waffle iron. Add cheese sliced and sliced deli meats atop donut. Top with another dipped down and firmly press down waffle iron and cook until golden. Zip with sauce and eat. Soak chickpeas overnight in a large mason jar in 3 cups of water. Make sure you only fill the jar with chickpeas about halfway—they expand! Drain chickpeas and dry completely. In the bowl of a large food processor, add the dry, swollen chickpeas, garlic, onion, parsley, lemon juice, salt and pepper. Pulse until combined and mixture resembles a small, coarse crumb. While the food processor is running, add the olive oil. Get a 3″ ring mold, or whatever you have around that will form little sliders, and pack the bottom with the chickpea mixture. Stuff with the feta cheese. Top with more of the chickpea mixture and press firmly. Gently remove the ring mold and voila! A feta-stuffed falafel slider patty ready to fry! Heat ½” of oil in medium sauté pan. 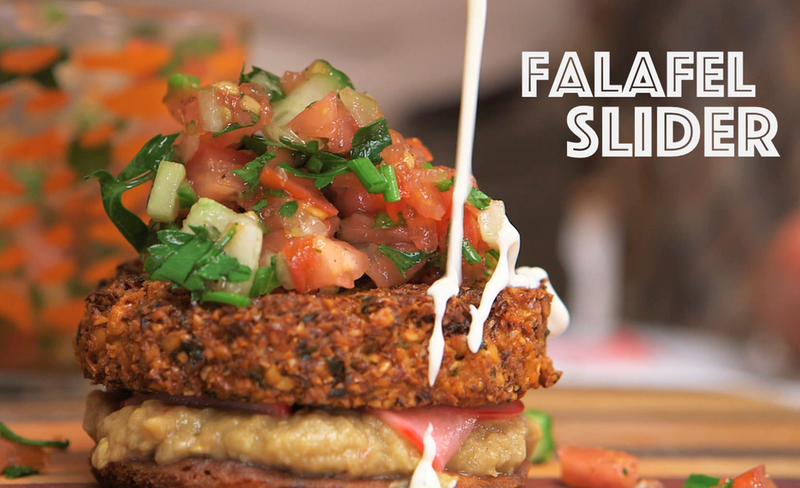 Gently transfer falafel patties to the hot oil and fry on both sides until golden brown. Drain on paper towels and hit with a small pinch of salt. Cut out rounds of flatbread with the same size ring mold (or invert a mug on the flatbread and trace around the rim with a knife). Pan-fry until golden and toasty. Set aside. Prick eggplant with fork several times. Cover in two layers of aluminum foil and cook over an open flame on medium heat until soft and mushy, about 45 minutes to an hour. If you don’t have a gas burner, just toss it in your oven at 375º until soft. Carefully remove mushy cooked eggplant from foil, scrape the flesh out of the skin with a spoon, and add to the bowl of a food processor. Add peanut butter, sesame oil, sambal, lemon juice, salt, and pepper, and puree. Transfer to a bowl and set aside to cool. Chop all ingredients and transfer to a small bowl. Drain radishes on a paper towel. Spoon baba ganoush on half of the pita rounds. Top with radish, then crispy falafel, salsa, and another pita round. Zip with white sauce and stuff your face! 2. Use a jar or your hand to roll out the bread until it’s flat. 3. Lay slices of meat and/or cheese on the bread. 4. 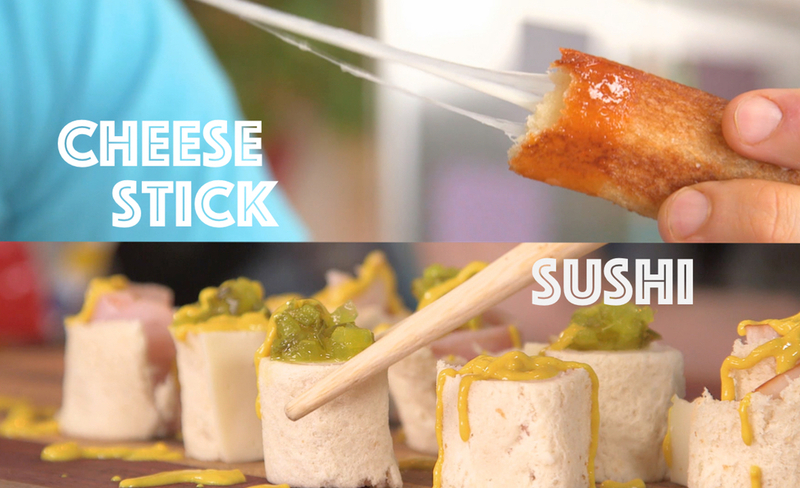 Roll that up and slice it lengthwise into four sushi-roll-style pieces. 5. Garnish with mustard and pickle relish. 3. Take your cheese and roll it up in the bread. 4. Fry it in a little oil (canola oil, also known as rapeseed oil, is our preferred choice). 5. Keep turning it until it’s golden brown on all sides. 6. Meanwhile, heat your tomato soup directly over a flame (remove any paper label first!). Dip your mozzarella stick right into it – you get the ooey gooey goodness.